I asked for opinions on cakes that feature feathers a couple of weeks back, and Janet Mohapi Banks of the insanely beautiful Janet Mohapi Banks Sculptural Cake Design in Surrey, UK, replied with this stunning cake. And I do mean stunning. 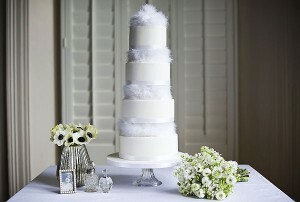 Frankly, I was on the fence about cake + feathers, but this one has made a believer of me! Four lovely tiers, trimmed in satin ribbon and spaced so that each looks as though it is floating on a cloud of soft, downy feathers. It’s whimsical meets minimalist, and I love it. If you love this cake by Janet, check out her other one that we’ve featured, this beautiful Pink Ombre Roses Wedding Cake.